Nicholas C. Barberis现任耶鲁大学管理学院Stephen & Camille Schramm金融学讲座教授，他本科毕业于剑桥大学，博士则毕业于行为金融学的大本营之一——哈佛大学经济系，师从于shleifer等著名金融学大师。他与导师及同事合作的如下文章："A Model of Investor Sentiment","Prospect Theory and Asset Prices","Style Investing" "Comovement"成为行为金融学领域的必读经典。2003年， Barberis受邀与Richard Thaler共同为Handbook of the Economics of Finance撰写了学术界第一份翔实、权威的行为金融研究综述："A Survey of Behavioral Finance"
Nicholas C. Barberis (born September 1971) is the Stephen & Camille Schramm Professor of Finance at the Yale School of Management. 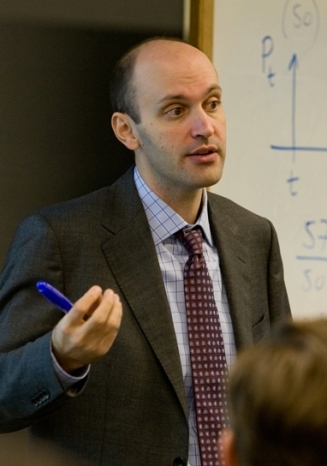 Professor Barberis' research focuses on behavioral finance and in particular, on applications of cognitive psychology to understanding the pricing of financial assets. Barberis earned his B.A. from Jesus College, Cambridge in 1991 and Ph.D. from Harvard University in 1996. Click here for a recent curriculum vitae. Click here for a description of my research agenda. The goal of much of my work is to build analytical foundations for behavioral finance, a large and active subfield of financial economics which studies the implications of less than fully rational behavior on the part of some market participants. "Extrapolation and Bubbles", (with Robin Greenwood, Lawrence Jin, and Andrei Shleifer), September 2015. "Prospect Theory and Stock Returns: An Empirical Test", (with Abhiroop Mukherjee and Baolian Wang), November 2014. "X-CAPM: An Extrapolative Capital Asset Pricing Model", (with Robin Greenwood, Lawrence Jin, and Andrei Shleifer), Journal of Financial Economics 115, 1-24, January 2015.Awarded the 2014 Jack Treynor Prize for research. "Using Neural Data to Test a Theory of Investor Behavior: An Application to Realization Utility", (with Cary Frydman, Colin Camerer, Peter Bossaerts, and Antonio Rangel), Journal of Finance 69, 907-946, April 2014. "The Psychology of Tail Events: Progress and Challenges", American Economic Review Papers and Proceedings 103, 611-616, May 2013. "Thirty Years of Prospect Theory in Economics: A Review and Assessment", Journal of Economic Perspectives 27, 173-196, Winter 2013. "Psychology and the Financial Crisis of 2007-2008", in Financial Innovation: Too Much or Too Little?, Michael Haliassos ed., MIT Press, 2013. "Realization Utility" (with Wei Xiong), Journal of Financial Economics 104, 251-271, May 2012. Two of my colleagues significantly advance this agenda here. "A Model of Casino Gambling", Management Science 58, 35-51, January 2012 (Special Issue on Behavioral Economics). "Preferences with Frames: A New Utility Specification that Allows for the Framing of Risks" (with Ming Huang), Journal of Economic Dynamics and Control 33, 1555-1576, August 2009. "What Drives the Disposition Effect? An Analysis of a Long-standing Preference-based Explanation" (with Wei Xiong), Journal of Finance 64, 751-784, April 2009. "Stocks as Lotteries: The Implications of Probability Weighting for Security Prices" (with Ming Huang), American Economic Review 98, 2066-2100, December 2008. "The Loss Aversion / Narrow Framing Approach to the Equity Premium Puzzle" (with Ming Huang), Handbook of the Equity Risk Premium, R. Mehra ed., North Holland, Amsterdam, 2008. "Individual Preferences, Monetary Gambles, and Stock Market Participation: A Case for Narrow Framing" (with Ming Huang and Richard Thaler), American Economic Review 96, 1069-1090, September 2006. "Comovement" (with Andrei Shleifer and Jeffrey Wurgler), Journal of Financial Economics 75, 283-317, February 2005. "Style Investing" (with Andrei Shleifer), Journal of Financial Economics 68, 161-199, May 2003. "A Survey of Behavioral Finance" (with Richard Thaler), Handbook of the Economics of Finance, G. Constantinides, R. Stulz, M. Harris eds., North Holland, Amsterdam, 2003. "Mental Accounting, Loss Aversion, and Individual Stock Returns" (with Ming Huang), Journal of Finance 56, 1247-1292, August 2001. "Prospect Theory and Asset Prices" (with Ming Huang and Tano Santos), Quarterly Journal of Economics 116, 1-53, February 2001. Awarded the 2000 FAME Research Prize. "Investing for the Long Run when Returns are Predictable", Journal of Finance 55, 225-264, February 2000. Awarded the 2000 Paul A. Samuelson Prize. "A Model of Investor Sentiment" (with Andrei Shleifer and Robert Vishny), Journal of Financial Economics 49, 307-343, September 1998. "How Does Privatization Work? Evidence from the Russian shops" (with Maxim Boycko, Andrei Shleifer, and Natalia Tsukanova), Journal of Political Economy 104, 764-790, August 1996. I learn a lot by working with PhD students and helping them with their dissertation work. Here are links to some of the students I have advised in past years. I very much recommend taking a look at their work if you are not already familiar with it!